It can be easy in an industry like ours to wake one day and find yourself living in a fish bowl; a million little cogs turn slightly larger cogs which in turn form a business. In such an all-consuming operation it is very important to keep some perspective, to occasionally rise to periscope depth and take a look at what is going on around you. At Hahndorf Hill we think that, for us to speak with credibility and confidence about our flagship variety Gruner Veltliner, it is critical that we keep abreast of Gruner’s evolving trends and styles. Hence, we regularly conduct internal staff training sessions where we blind taste through flights of Gruner Veltliner from premium Austrian producers as well as from our friends and neighbours here in the Adelaide Hills. 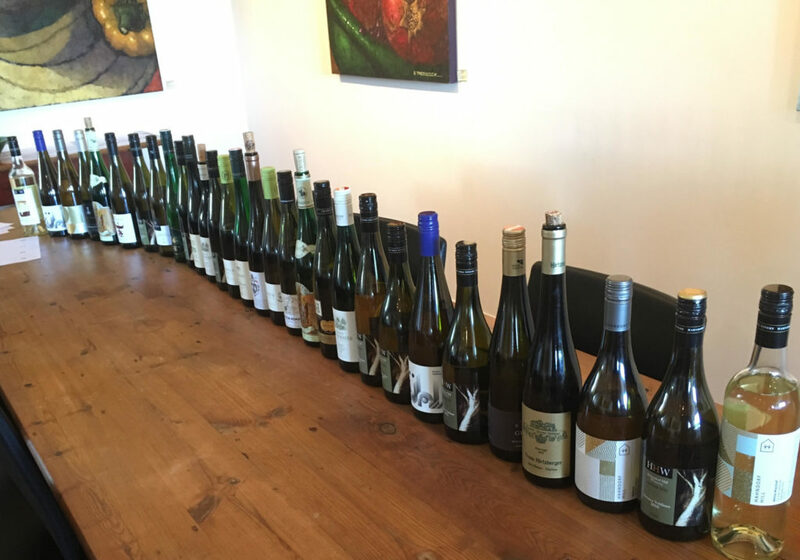 Our most recent training session featured 30 Gruners in a range of styles, spanning five vintages and from several regions. It never ceases to amaze me how versatile and flexible this variety is; the wines ranged from pretty and delicate to powerful Alphas. There were some shy wallflowers, some supernovas and everything in between. I have never claimed to be unbiased so I type this with a straight face and a clear conscience: Gruner Veltliner is the most expressive conduit for terroir of any variety I have tasted. I really felt I could almost hear the shifting loess of Langenlois crunching underfoot from 15,000kms away. Of the 30 wines we tasted I would like to draw your attention to a few bottles that really stood out for me. I have written previously of Weingut Knoll from the village of Unterloiben in the Wachau, and I am over the moon to do so again. A family winery now run by its third generation, Knoll sources its fruit from some of the most acclaimed and exclusive vineyards in all of Austria. The famous Loibenberg vineyard is south facing and is one of the most easterly vineyards of the Wachau; it is also one of the largest and steepest. Its exposed position and steepness give each vine a taste of the warm sun and breeze; this vineyard is famous for producing wines of power and richness and the 2015 Knoll Loibenberg Smaragd is no exception. This wine leads with warm ripe stone fruit and delicate pear, an opulent palate of melon and nectarine is beautifully balanced by a cleansing acidity. This wine is the complete package; it has class, sophistication and weight. Franz Hirtzberger, situated upstream at the other end of the valley in the village of Spitz, is another multi-generational family business famous for producing some of Austria’s most acclaimed wines. A founding father of the Vinea Wachau, the organization responsible for the Wachau Codex, Franz has been instrumental in Austria resuming its place amongst the world’s great wine producing countries. 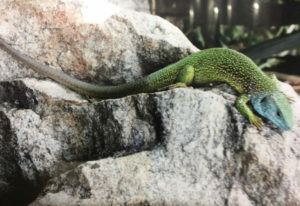 Sourcing its fruits from some of the coolest sites in the DAC has given the wines of Hirtzberger a reputation for spice and finesse. The site now named “Axpoint” was first documented in 1243 AD and is located on the valley floor giving it a predominantly loess composition. The 2015 Axpoint Smaragd is rich and full bodied; the ripe peach and orchard fruits have been expertly lassoed by a crisp and refreshing acid. The fruit from sites higher up the terraced slope is well known for is slightly salty minerality, whereas this wine from the flatter base is more generous in its fruit whilst keeping the region’s signature savoury, peppery finish. Weingut Brundlmayer is a destination for wine lovers and foodies alike; their cellar door and restaurant in the Kamptal village of Langenlois is the embodiment of the family’s philosophy of embracing the nature of their environment. The Gruners of Langenlois have a distinct style; they tend to be leaner and more floral than the other premier Austrian regions and as a result they are excelling in the “Sekt” (sparkling) category, but that doesn’t mean you shouldn’t keep a very close eye on the fuller-bodied Reserve wines. The 2015 Brundlmayer Kammerner Lamm was produced from fruit picked from the uber-exclusive Lamm block which has been recognized by the Österreichische Traditionsweingüter (Association of Austrian Traditional Wine Estates) as consistently producing fruit of the “utmost finesse, the richest character, the longest life”. This south facing block occupies the warmest spot on the edge of the valley and has for generations produced wines described as plump and ripe. The blend of Austrian acacia and local oak has built a broad and well-lit stage for the actors playing ripe stone fruit and savoury vegetals to sing at the top of their lungs. This is a big wine. I distinctly remember the moment Larry and I got to this wine in the flight because I could feel his eyes boring into me, waiting for me to make up my mind so we could discuss it. Brundlmayer say on their website: “While ‘Lamm’ is the quintessence of a monumental Gruner Veltliner, it abandons the lightness and prickle that Gruner Veltliner usually stands for.” I know what they mean, this wine is no push over. The 2015 Kammerner Lamm shares a common ancestor with the delicate “sushi friendly” wines of its neighbours, but I suspect it was made with steak in mind. 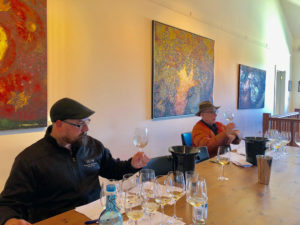 Finally, I would like to give a special mention to a wine in the tasting that really got us talking: The 2017 Groiss Gruner Veltliner is a delight. Soaring aromatics of pear and white blossom complement a full and pure palate. It was not only its obvious excellence that drew Larry and I to this wine but also its place of birth; the Weinviertel is a region most commonly associated with mass produced cheap wines (similar to our Riverland), but Ingrid Groiss has deliberately set her sights on a quality over quantity direction and we are all the richer for it. See, sniff, spit – Larry and Jack working through 30 Gruner Veltliners. 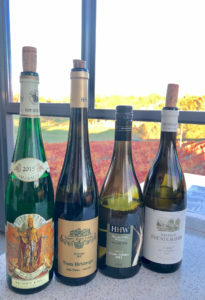 This entry was posted in Adelaide Hills, Adelaide Hills best Cellar door, Adelaide Hills Gruner Veltliner, Adelaide Hills wine, Adelaide Hills wine region, Blaufrankisch, cool climate wine, dessert wine Aelaide Hills, Diurnal variation temperature, Gruner Veltliner, Gruner Veltliner Australia, Hahndorf, St Laurent, Uncategorized, wine and tagged Adeaide Hills cellar door, Adelaide Hills, Adelaide Hills wine, Adelaide Hills winery, cool climate wines, Diurnal variation temperature grapes, Gru, Gruner Veltliner, Hahndorf Hill Gruner Veltliner, Zweigelt. Bookmark the permalink.